Way back in 1951, there were 4.2 million licensed vehicles using UK roads. This has now risen to over a staggering 35.6 million licensed vehicles. Since then, road networks have of course increased and road condition and safety have also improved. Some 184,800 miles of road were available in 1951 compared to 245,800 miles as of now. However, congestion is rapidly increasing due to road networks being unable to sustain the growth of traffic as the demand for vehicles increases. 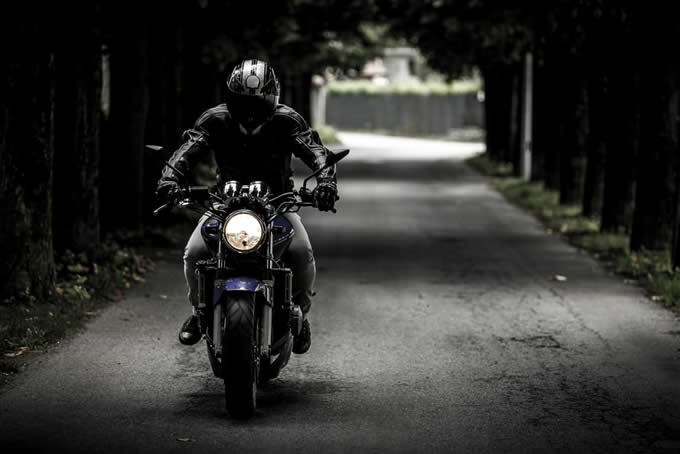 For most motorcycle riders, staying safe is top priority and with ever increasing traffic congestion comes frustrated road users that can be unpredictable, act irrationally and sometimes dangerously. As our roads are becoming more hazardous with an ever increasing potential for an incident, a defensive riding strategy is essential to all motorcycle riders. Defensive riding requires the rider to continuously stay alert. Just a short lapse of concentration can easily result in an incident. If you begin to feel tired, find somewhere safe to pull over for a break. Observation is about knowing what’s going on all around you, appropriate use of mirrors and to use anything to your advantage – for example, using reflections in widows to spot hazards and looking through parked car windows to gain a better view of the road. Effective observation though essential, is only useful if you have awareness of the potential hazards that you’re looking for. You’re observing, have become aware of a hazard and now you need to anticipate what might happen and plan accordingly. Never assume other road users are going to do the correct thing. For example, the car intending on moving out of the junction ahead might have difficulty seeing me in the position that I’m in. Plan ahead and consider putting yourself in a position that allows you to be seen, or adjust your speed so that you have the ability to slow down or stop if the vehicle exits the junction. You put an effective plan into action and therefore you are staying in control of the situation. As a defensive motorcycle rider, maintain a visible presence and avoid dark clothing that’s difficult to see. You can start by making things easier for yourself by increased visibility. A black bike and black leathers might look cool but it doesn’t do much for visibility. High visibility clothing and reflective tape for your motorcycle will increase visibility making it significantly easier for other road user to see you. Daytime running lights (DRL) will also aid in visibility. If your bike doesn’t have DRL’s, you can manually fit some. These are bright and help to increase visibility during the daytime, but must not be used during low light as they can blind other road users. If DRL’s aren’t for you, ensure you ride with dipped lights during the daytime. It’s important to be always alert and observant as an incident can occur on any road and at any time. Here are essential defensive riding tips that cover particular situations where motorcycle riders are at most risk. Junctions – Junctions represent the single most hazardous aspect of motorcycle riding. Good defensive riding will see a rider looking ahead for signs that indicate a junction is ahead and other indications such as gaps in houses or cars crossing the road ahead. Assess the junction and ride at a speed that allows you to stop safely or that allows you an escape route. Ask yourself; is the junction busy, can I see everything at my current speed or should I slow down and can they see me? If the driver can’t see me, what shall I do? Overtaking – Another statistic high on the motorcyclists accident list is overtaking. Most accidents occur when a rider is overtaking slow moving traffic (or ‘filtering‘ as it’s often referred to), where a vehicle is turning right. Remember, don’t assume that other road users will always do the correct procedure and always expect the unexpected. Good defensive riding will see the rider keeping a keen eye on vehicle signals (particularly those turning right), and to be especially careful where right-turn junctions are located. Bends – Another accident hotspot for motorcyclists are bends. Always ask yourself; how sharp is the bend, is my road position correct, am I going too fast and can I stop safely if I need to? Most accidents at bends occur either due to speed, where the motorcycle loses traction with the road surface, or the rider fails to stop in time due to a hazard. Always consider weather and road conditions as this is particularly vulnerable to motorcycle riders. Following distance – A vehicle may slow down or change direction with little or no warning. Maintaining a safe following distance from vehicles in front allows you time to think, slow down or stop if necessary. The 2 second rule offers a simple method for maintaining safe following distances. If a vehicle is following you too closely (tailgating), the safest process here is to gradually slow down to increase the distance from the vehicle in front. This allows you more time to slow down if necessary and reduces the potential for the vehicle behind to collide. Speed – Excessive speed is a major cause of accidents for motorcycle riders. The faster you travel, the less time you have to react to a hazard. If there’s the potential for hazards to develop, always keep to a speed that allows you an escape route. An escape route can be anything from and change of direction to slowing down or stopping. Country roads – Other than sharp bends detailed above, country roads have their own set of hazards. Road surfaces can often be worn and uneven and may contain more potholes. Farm traffic often uses country roads and can leave mud and debris. There’s often no pavements in rural areas, so be prepared to see pedestrians or horses walking in the road – this can be especially hazardous on bends. Continually assess what’s going on around you. Make frequent use of mirrors and observe the blind spot before changing direction. Always be aware of what’s directly around you and behind you, but it’s important that you know what’s going on in front, up to the horizon. Constantly scan the road ahead from near to far distance and from side to side. Recognising hazards is integral to defensive driving. It takes experience to recognise all hazards and when you do, allow for enough time and space to respond so that it doesn’t become a danger. Follow the OSM PSL routine each time you recognise a hazard. Observe to check the position and distance of following traffic by using mirrors or looking behind if safe to do so. Signal your intention to change direction if necessary. The manoeuvre now has three parts: position yourself in good time so that you can negotiate the hazard, adjust your speed so that you are able to safely slow or stop if necessary and continually look to assess changes in the situation or any new potential or developing hazards.